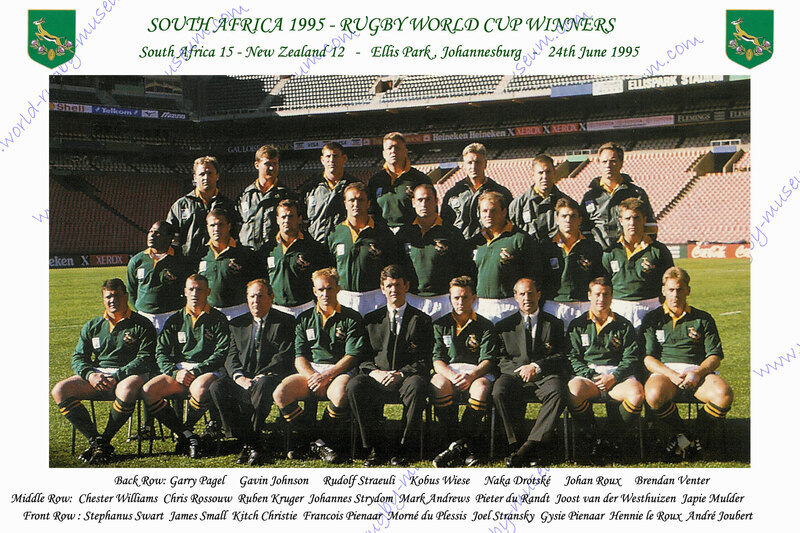 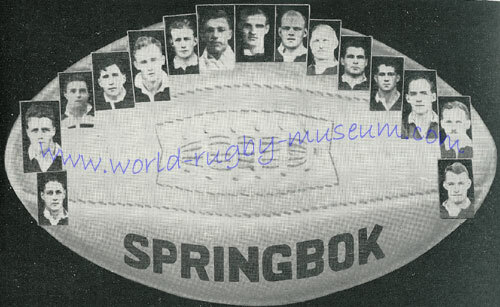 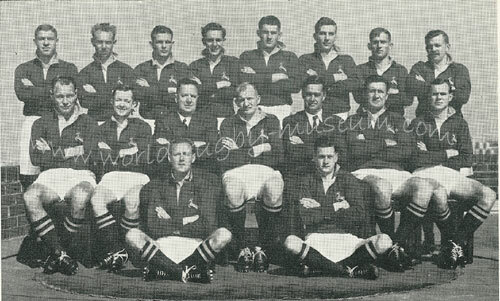 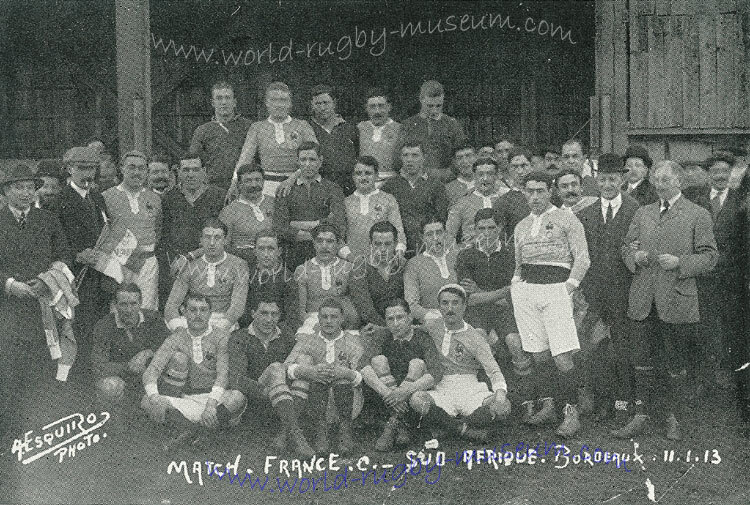 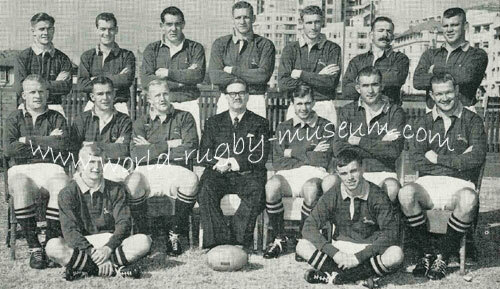 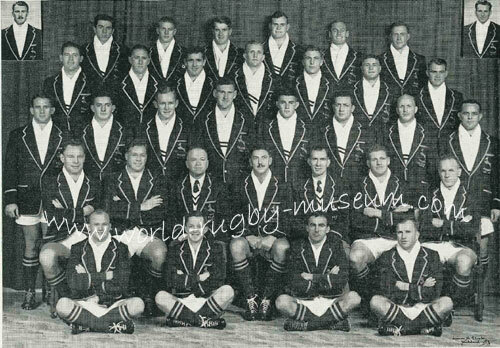 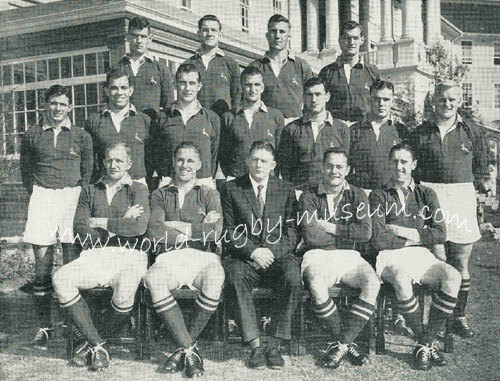 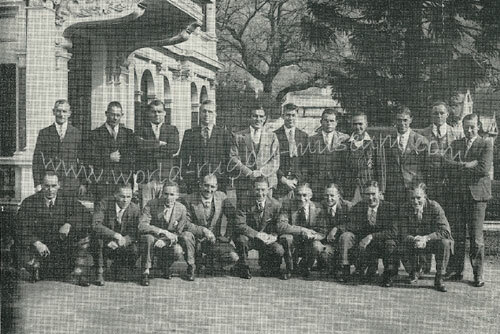 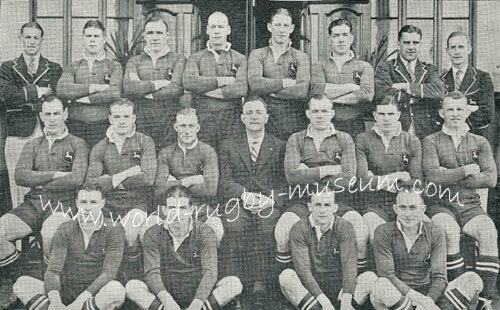 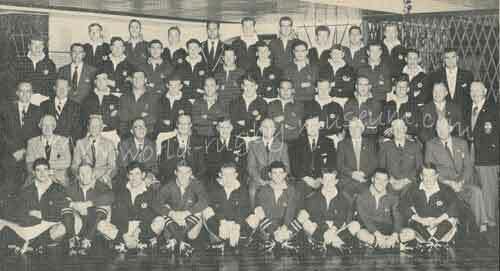 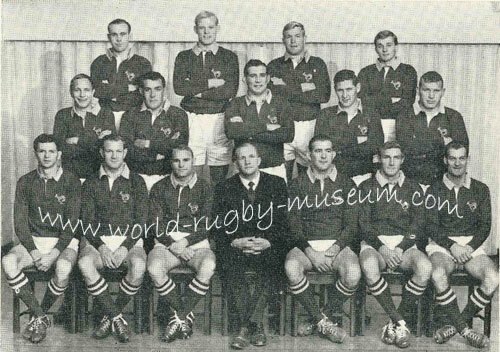 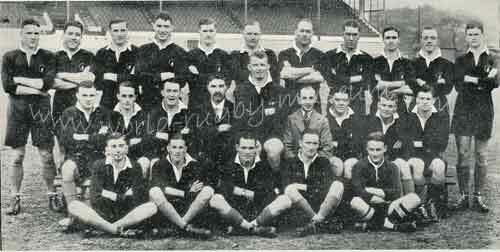 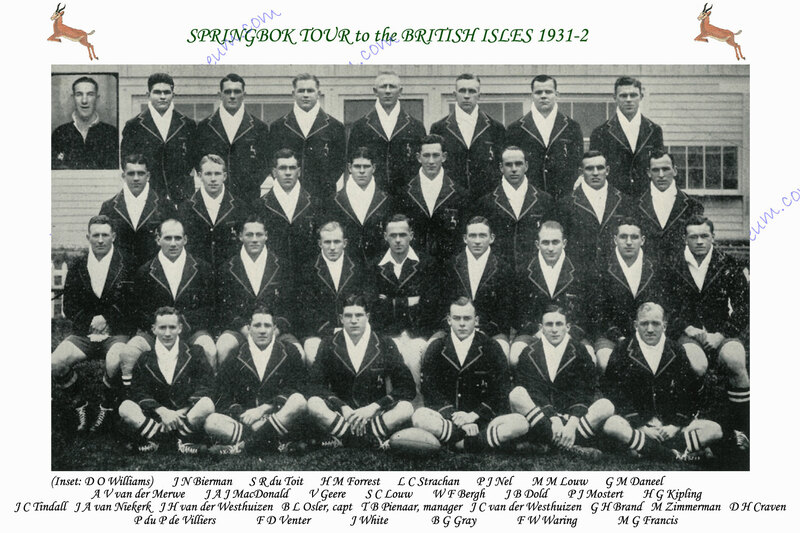 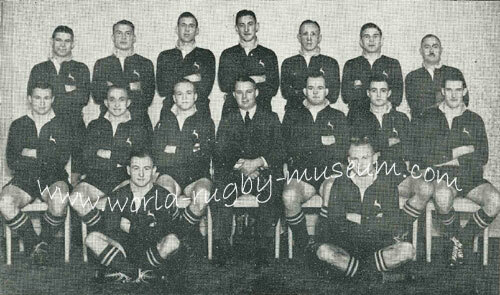 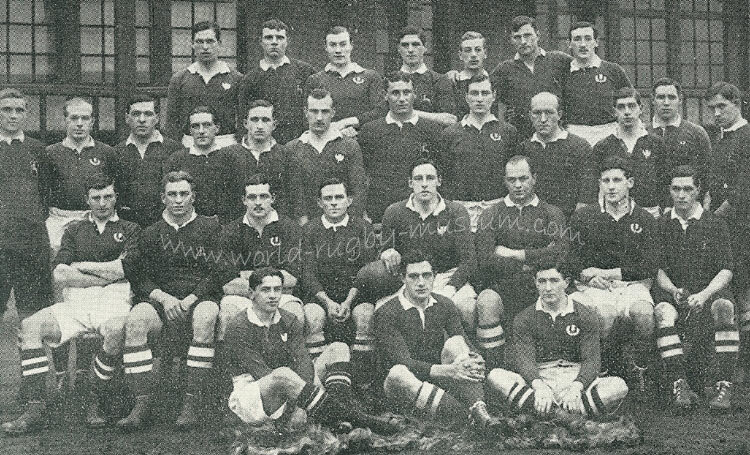 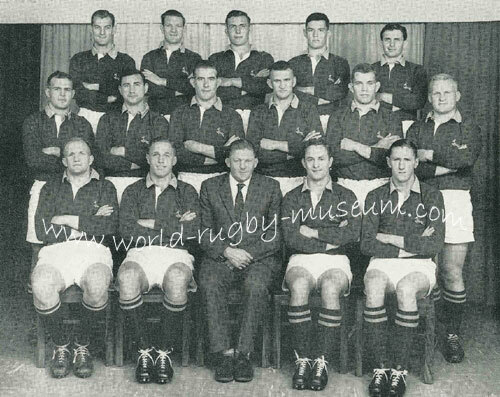 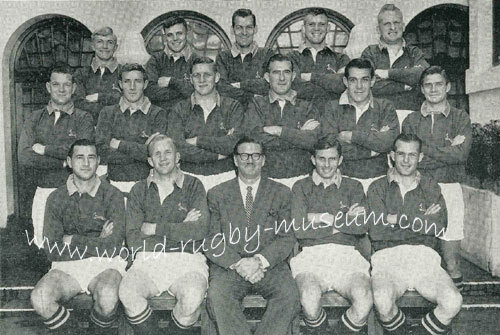 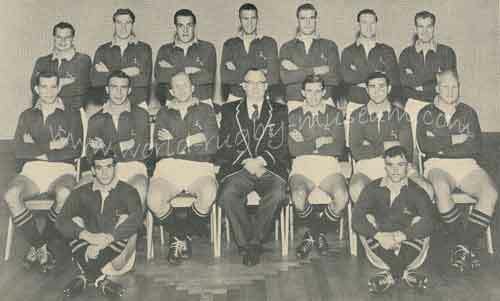 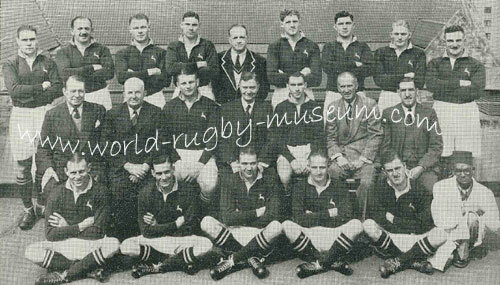 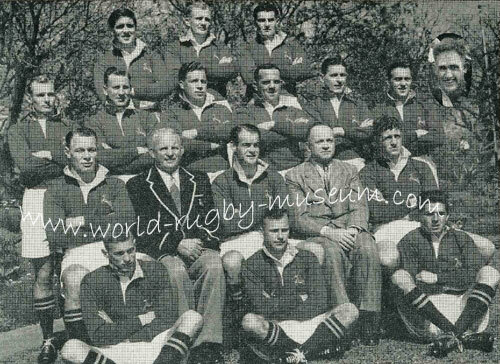 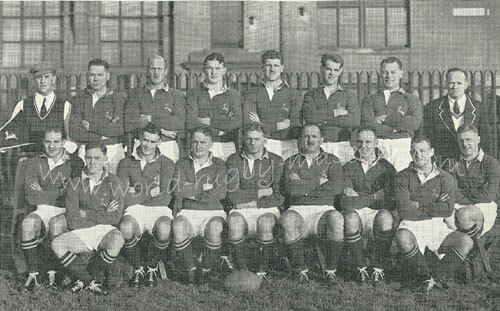 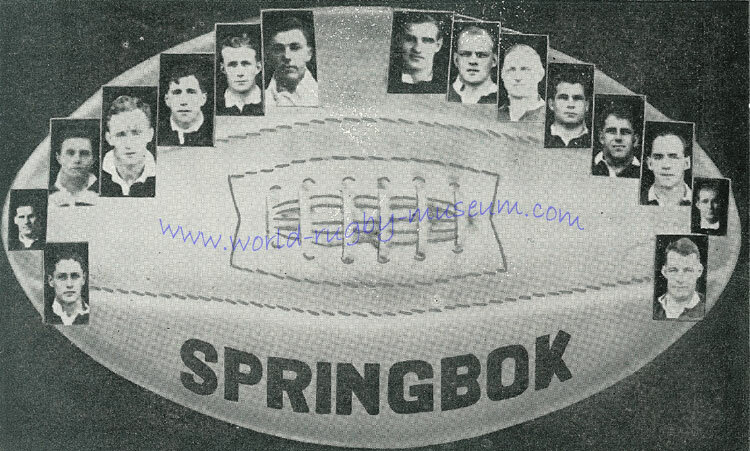 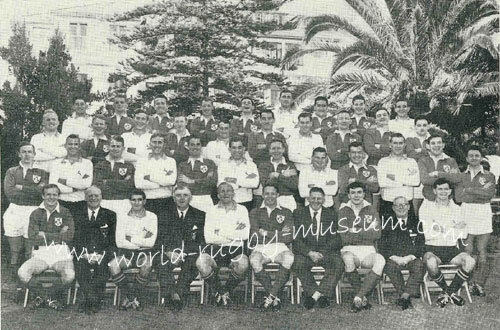 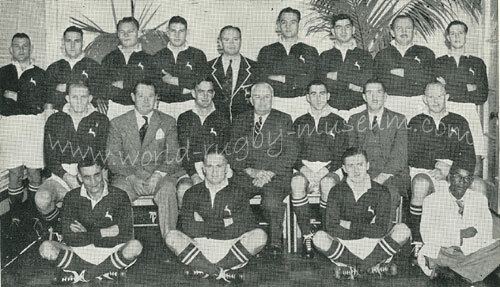 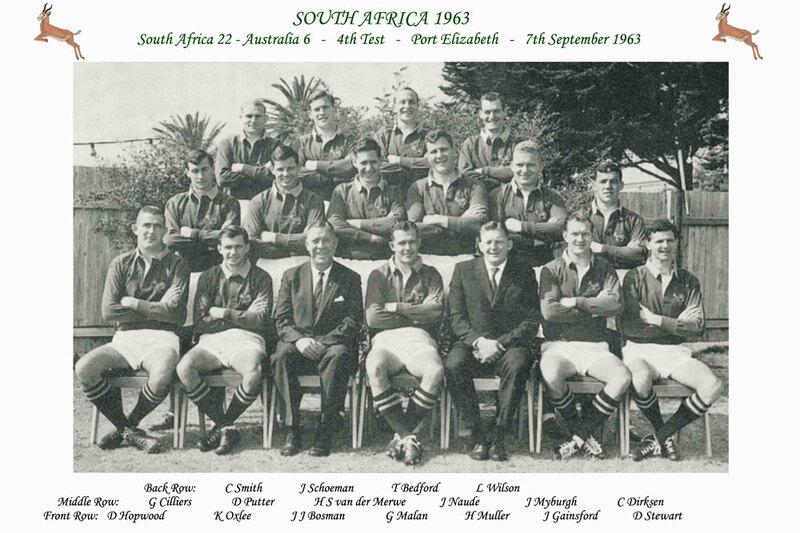 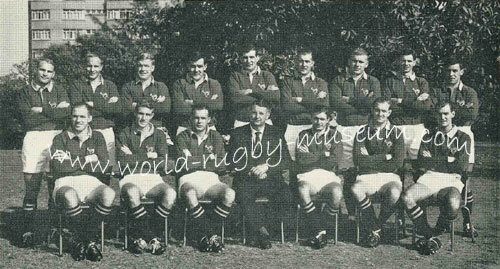 On this page you will find photographs of Springbok and South African teams & players through the ages. 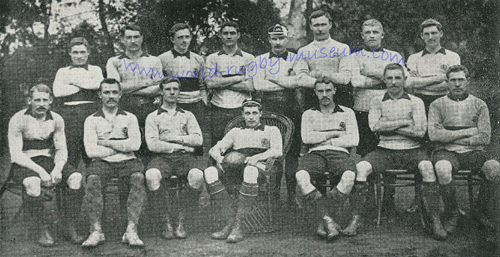 Click on the 'add to cart' buttons to purchase the required size of photograph. 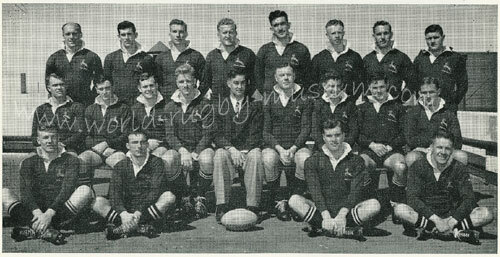 The www.rugbyrelics.com website address will not appear on the photo when purchased. 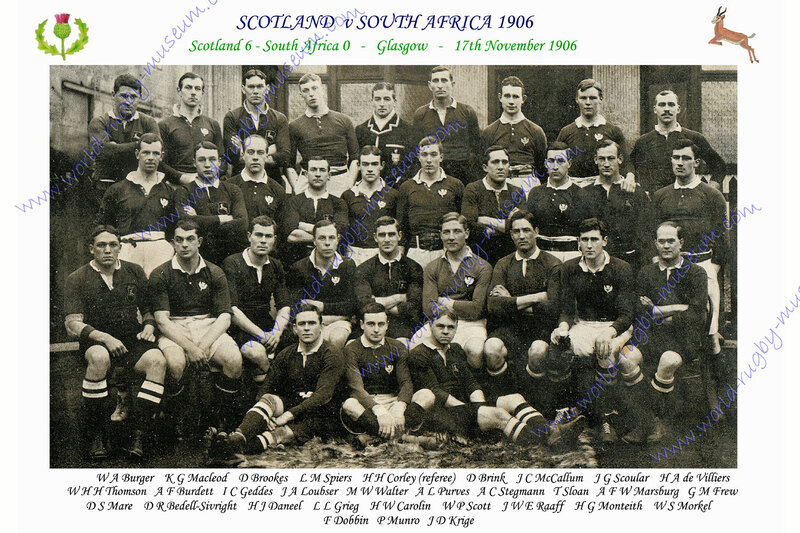 Prices for larger sizes and image reproductions are available on request. 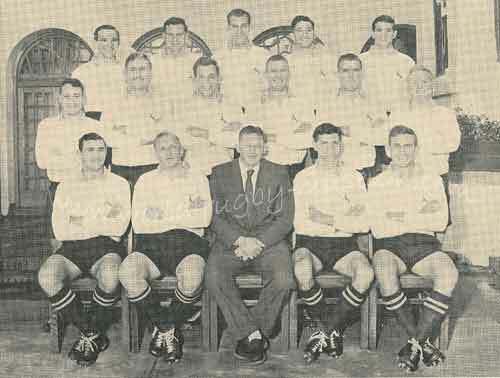 W A Burger, K G Macleod, D Brookes, L M Spiers, H H Corley (referee), D Brink, J C McCallum, J G Scoular, H A de Villiers, W H H Thomson, A F Burdett, I C Geddes, J A Loubser, M W Walter, A L Purves, A C Stegmann, T Sloan, A F W Marsburg, G M Frew, D S Mare, D R Bedell-Sivright, H J Daneel, L L Grieg, H W Carolin, W P Scott, J W E Raaff, H G Monteith, W S Morkel, F Dobbin, P Munro, J D Krige. 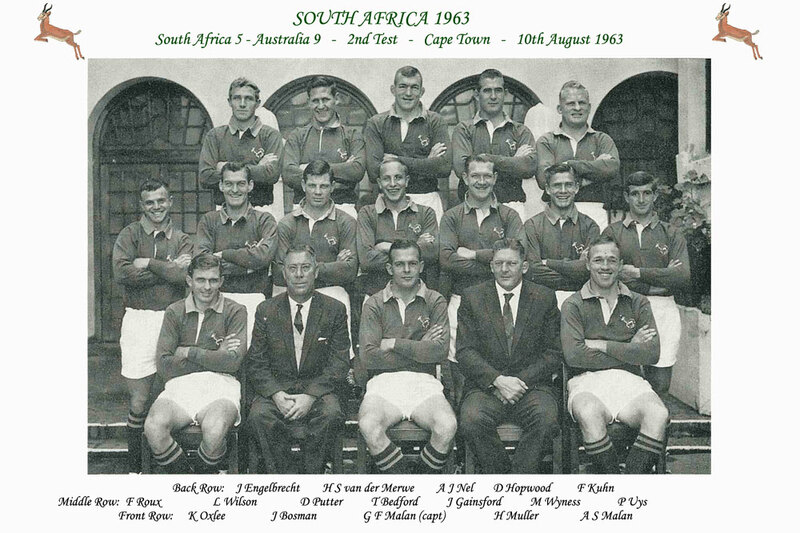 V V Drennan, S H Ledger, J J Clune, F G Schute, H M Read, C Adams, T van Vuuren, H Moore, R D Patterson, J Francis, R Watson, A S Knight, R B Burgess, G Thompson, G S Brown, J Stegmann, D F T Morkel, F J Luyt, J D Dallas (referee), R R Luyt, R A Lloyd, W A Miller, M Abraham, W H Morkel, G W Holmes, S B Campbell, J Morkel, J B Minch, F J Dobbin, C P Stuart, P G Morkel. 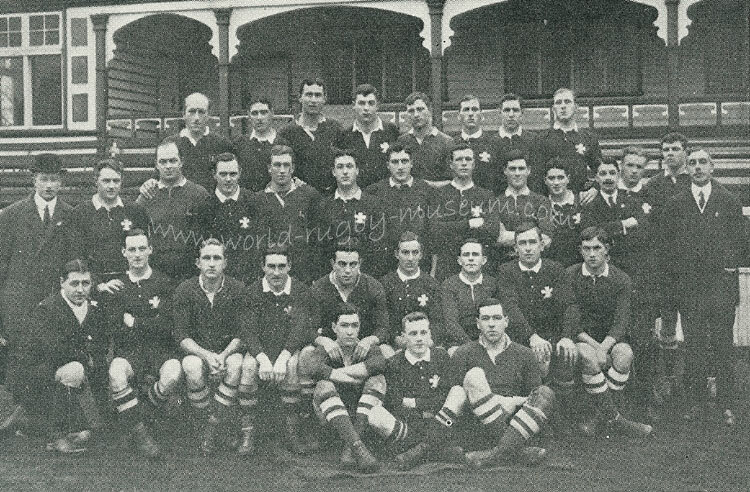 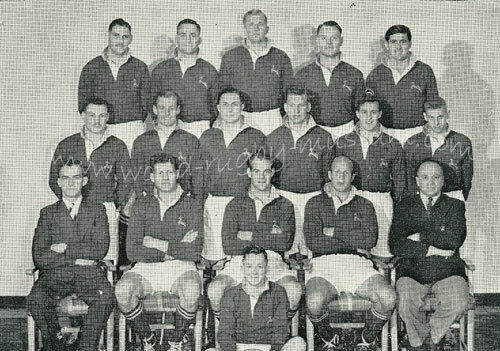 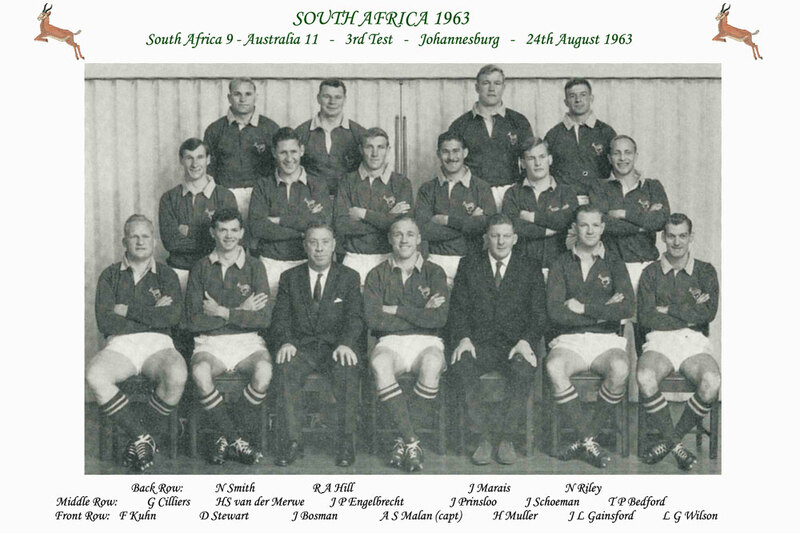 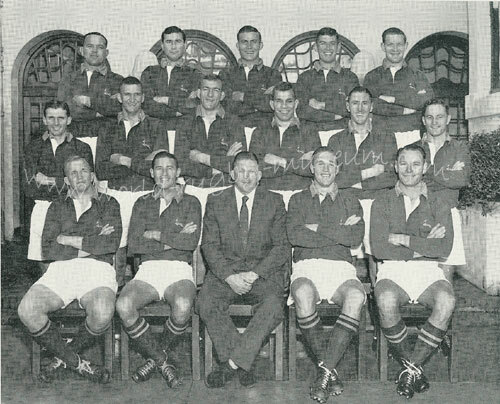 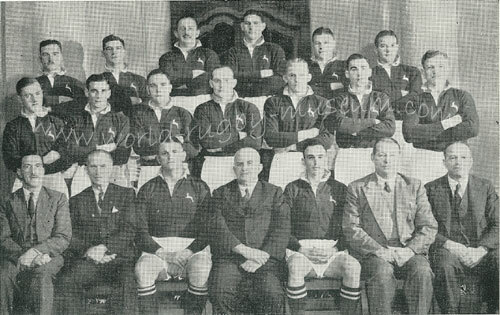 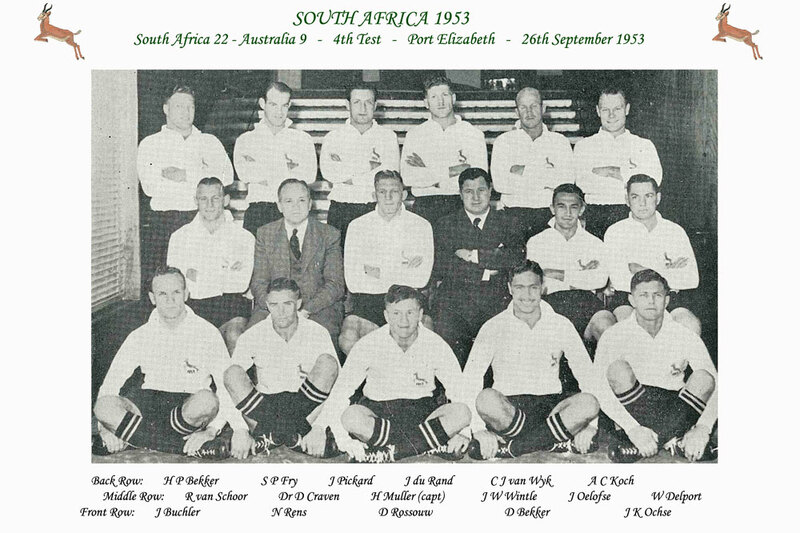 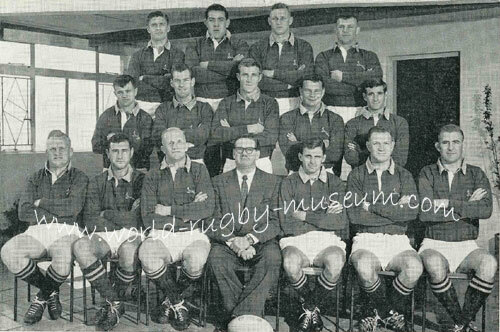 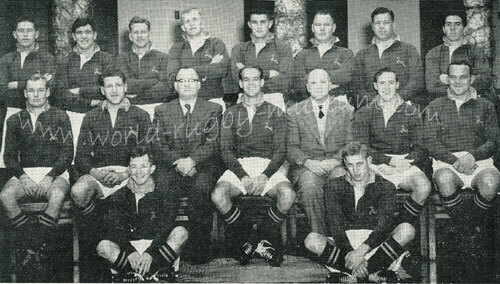 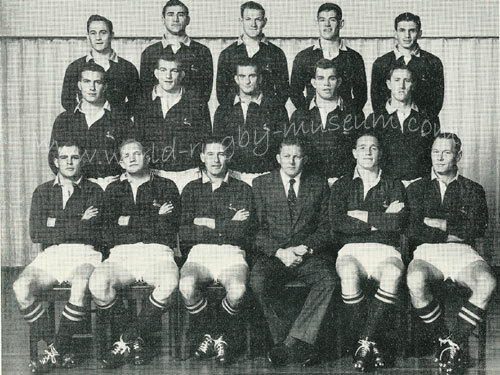 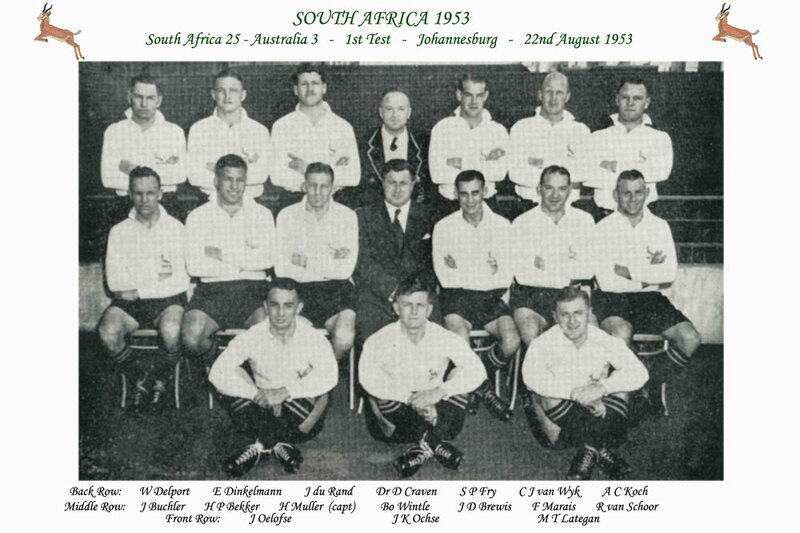 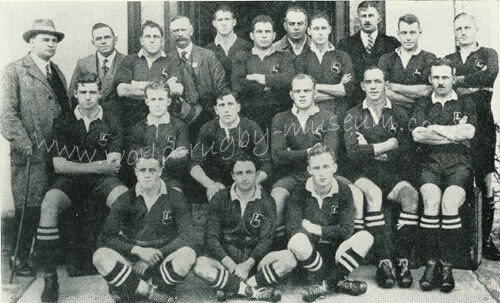 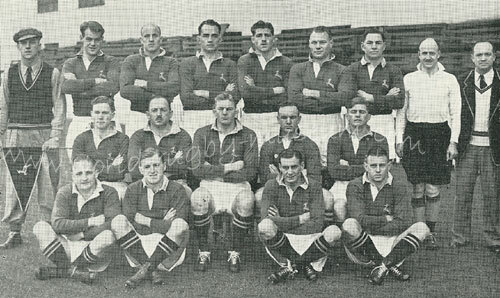 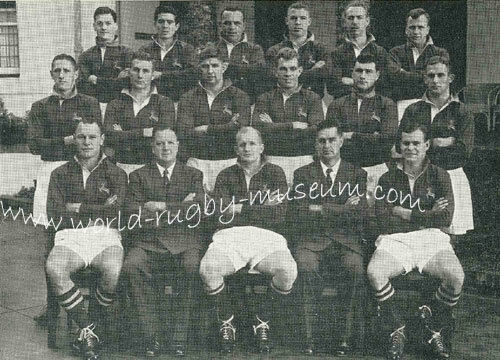 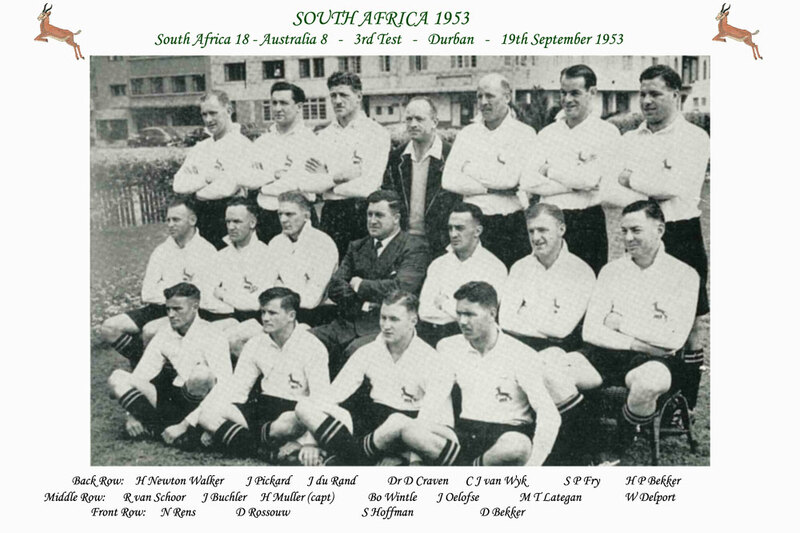 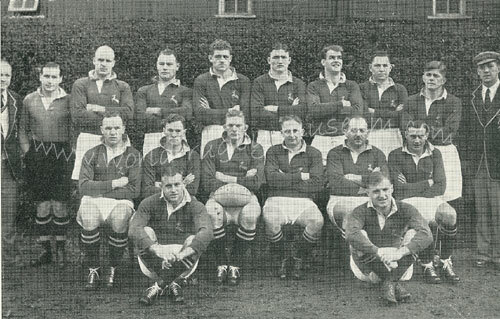 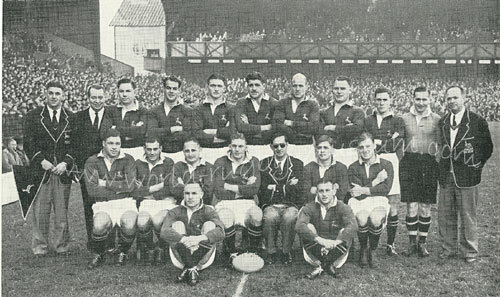 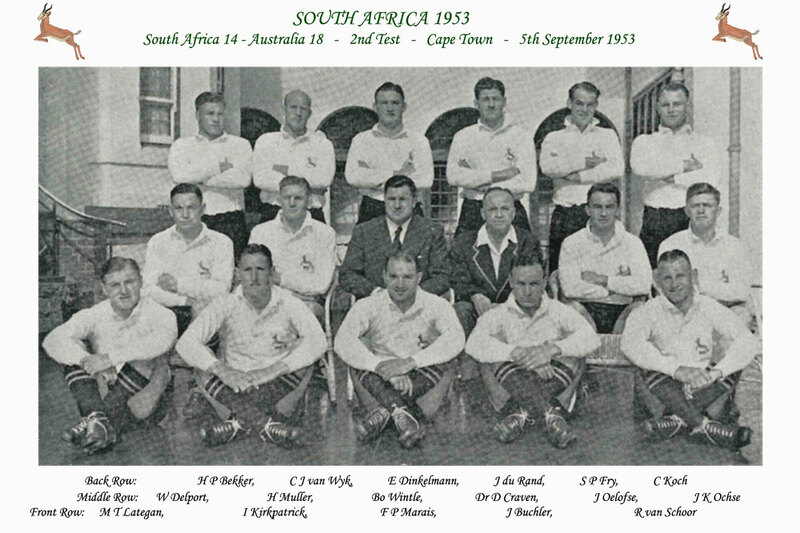 (Inset: D O Williams), J N Bierman, S R du Toit, H M Forrest, L C Strachan, P J Nel, M M Louw, G M Daneel, A V van der Merwe, J A J MacDonald, V Geere, S C Louw, W F Bergh, J B Dold, P J Mostert, H G Kipling, J C Tindall, J A van Niekerk, J H van der Westhuizen, B L Osler, capt, T B Pienaar, manager, J C van der Westhuizen, G H Brand, M Zimmerman, D H Craven, P du P de Villiers, F D Venter, J White, B G Gray, F W Waring, M G Francis. 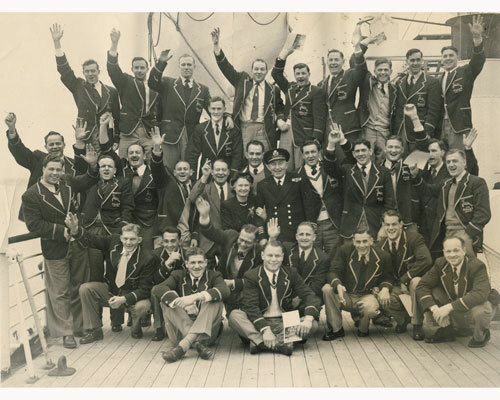 20th February 1952 - Returning home after a successful Grand Slam tour of France and the British Isles, the 1951/2 Springboks are pictured on board the Carnarvon Castle at Southampton. 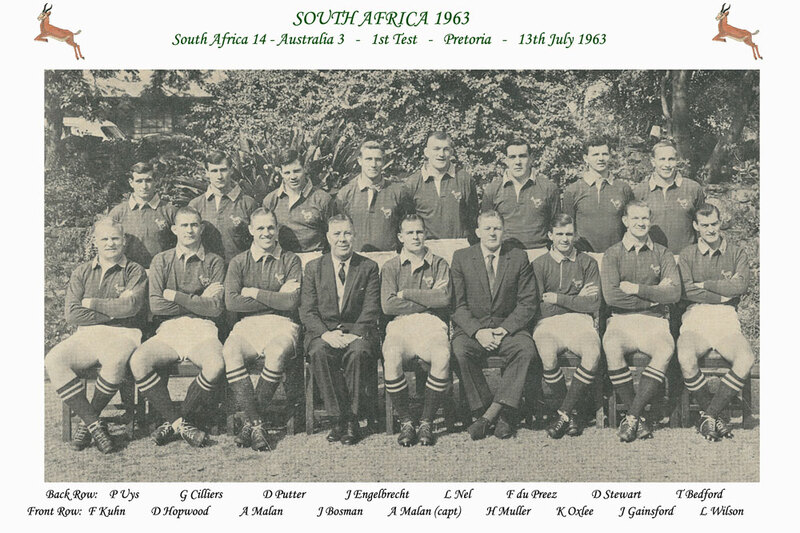 Please see the drop down menu below for sizes (in inches) available. 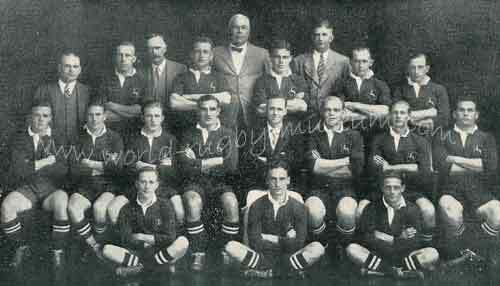 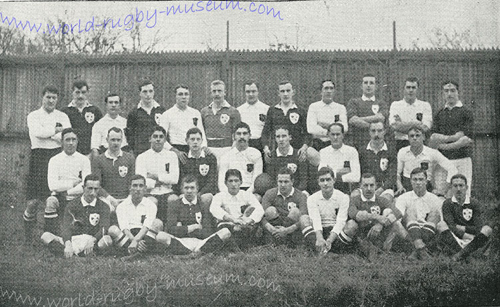 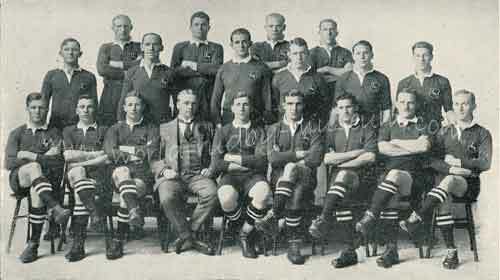 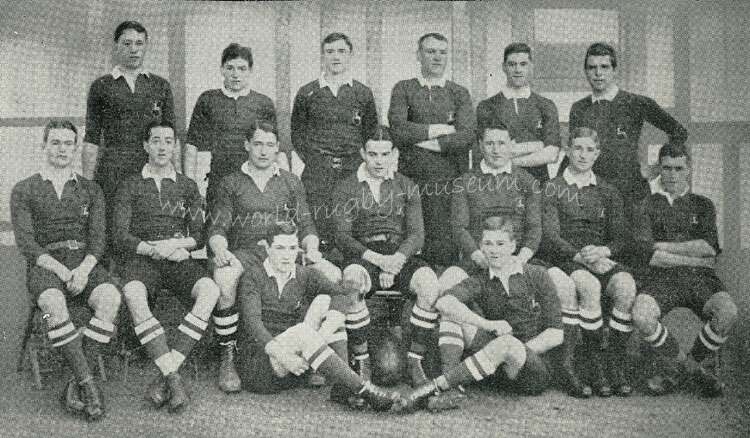 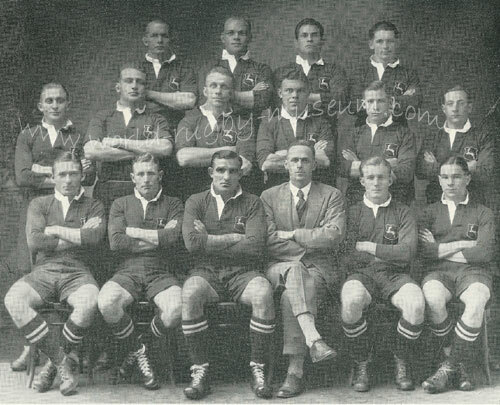 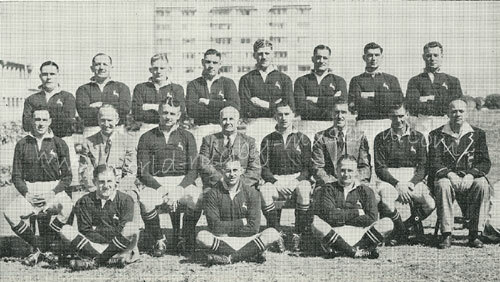 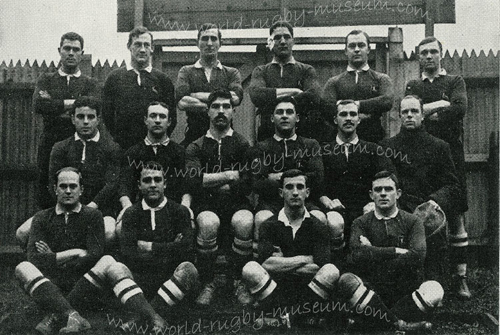 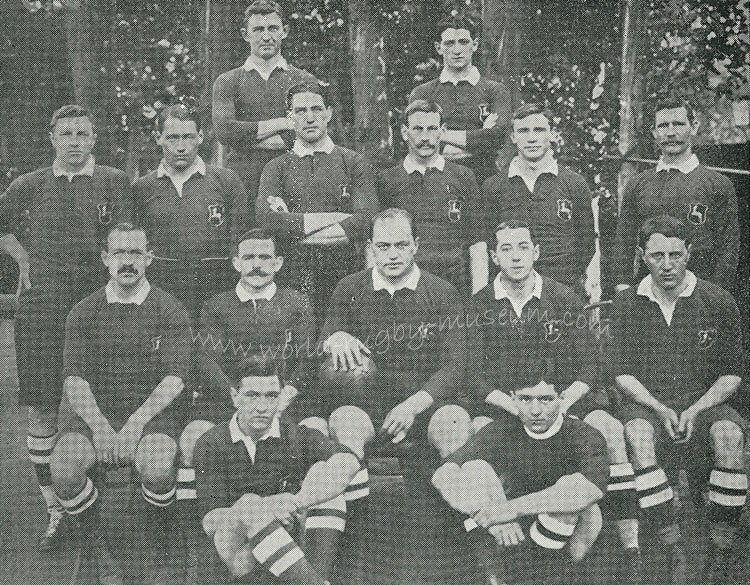 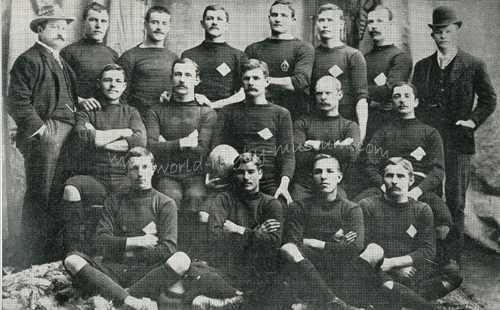 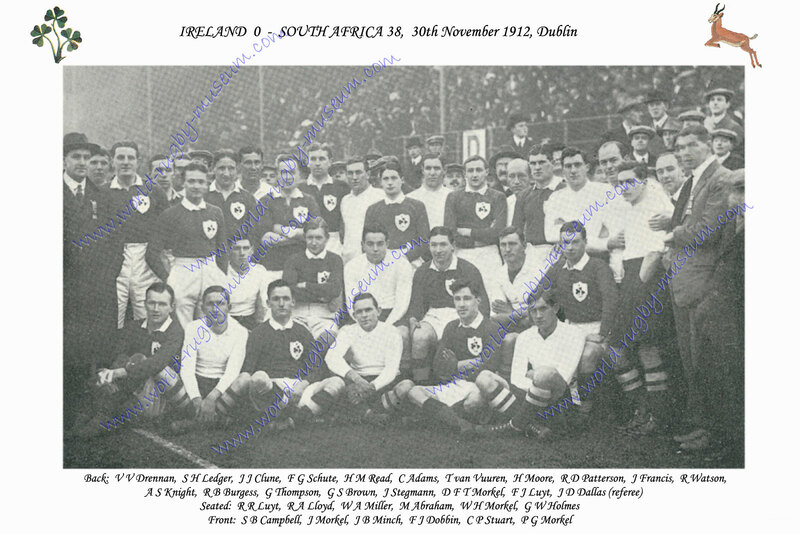 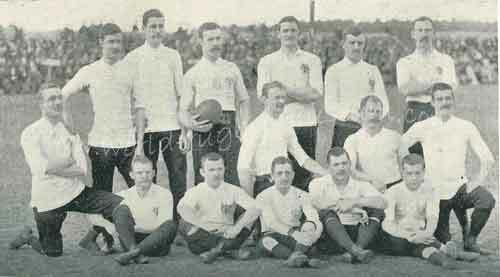 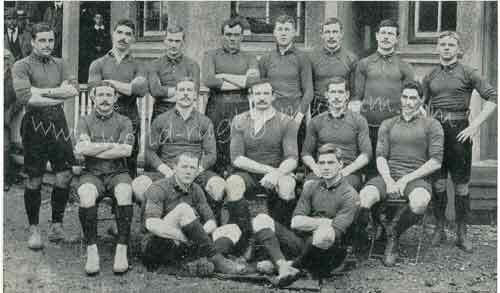 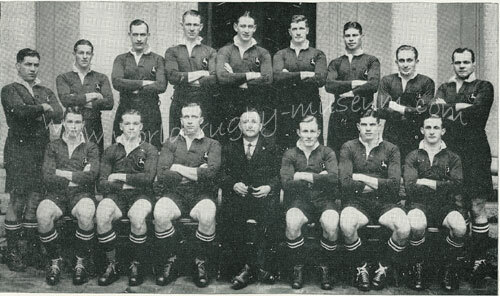 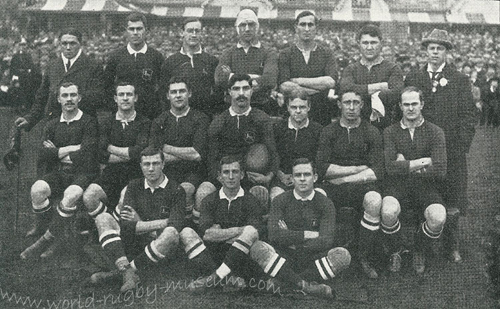 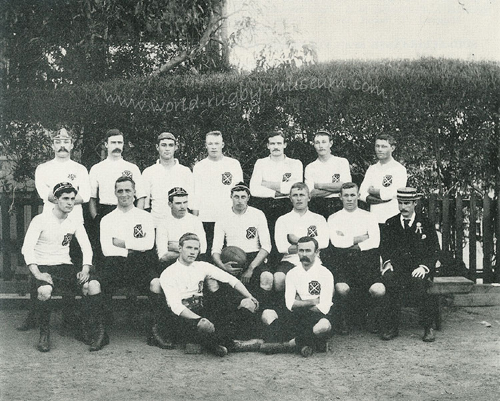 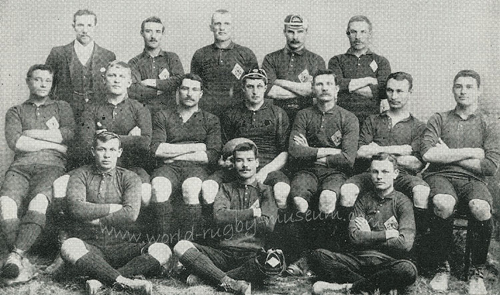 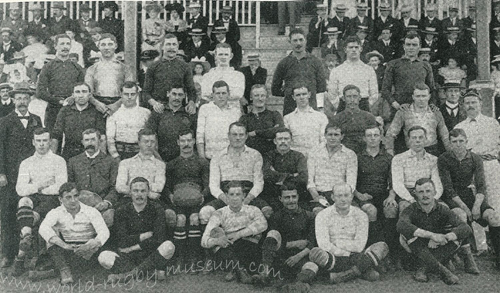 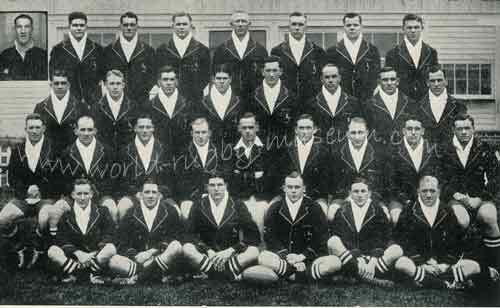 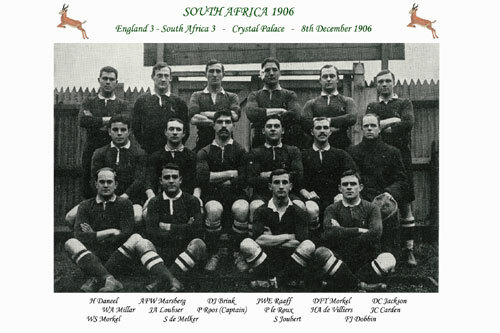 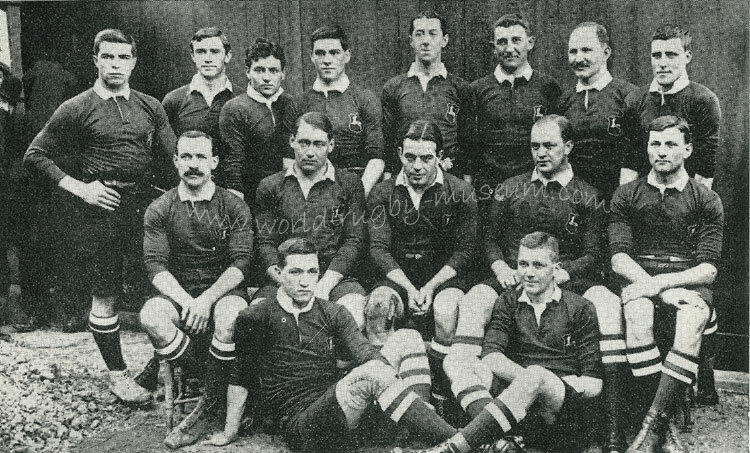 The Springbok team that defeated Wales 11 - 0 in 1906. 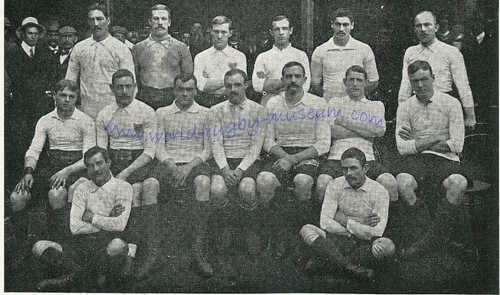 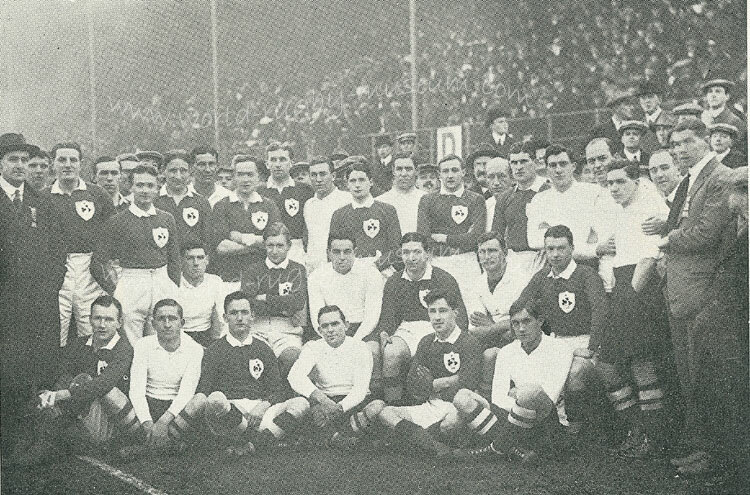 Photos are available either as 'photo only', without any captions, or 'named' with a title and the players named below. 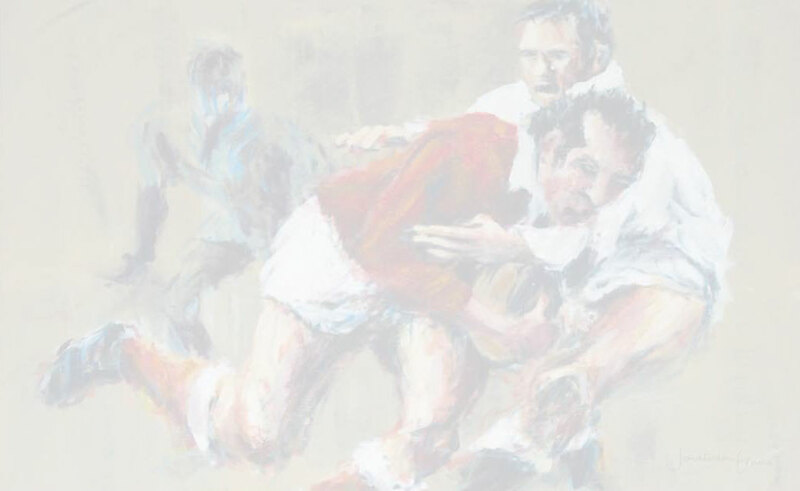 See the examples below for these options. 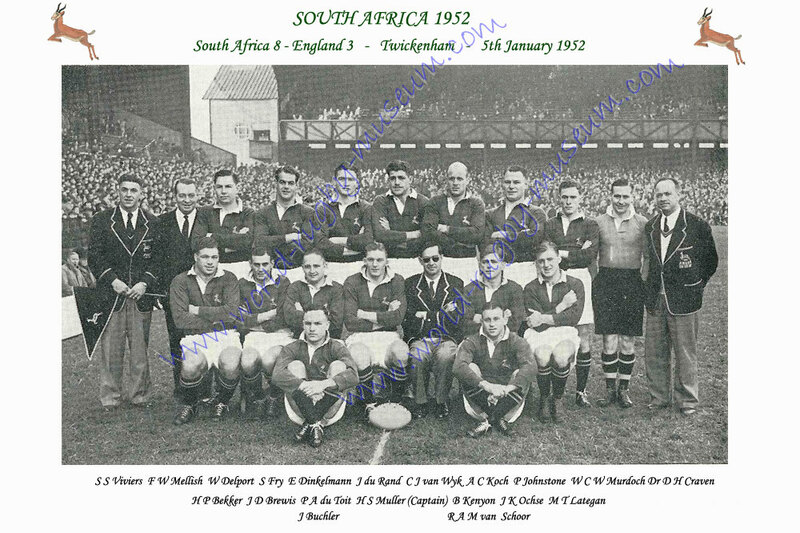 When ordering photos from this section please quote SA Photo followed by the opposing team, date and test if applicable + size + photo only or named option + price. 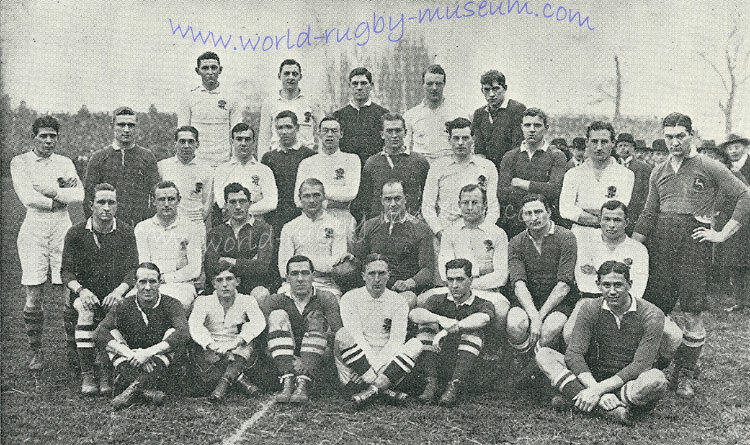 Please click on the links below for a low resolution sample of the photo available, the match score is below each link.